Where is Bali nestled among Indonesia's more than 17,000 islands? Bali is the most famous of the thousands of islands in the Indonesian archipelago. The busy island of over 4 million residents has been a tourist favorite for decades. It's certainly the top destination in Indonesia. The wide beaches in the south and lush, volcano-dominated interior attract close to 3 million foreign tourists per year! Scores of Indonesians from other islands also take advantage of Bali's beauty each year. Bali is a 95-mile-wide island located in the Indian Ocean, only two miles east of the tip of Java — the world's most populous island and home to over 141 million people. Bali sits at the very western tip of the Lesser Sunda Islands, a string of islands that includes Lombok, Flores, Timor, and others. 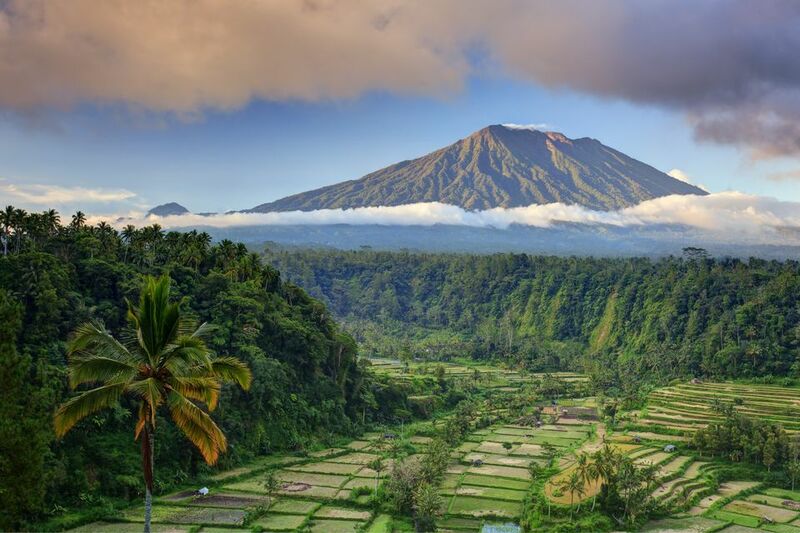 Bali's closest neighbor to the west is the island of Lombok, home to Mount Rinjani. Bali is located approximately 1,600 miles due north of Perth in Western Australia. Bali is approximately 600 miles east of Jakarta, the capital of Indonesia. The small islands of Nusa Penida and Nusa Lembongan are located to the southeast between Bali and Lombok. Elizabeth Gilbert certainly pushed Ubud, Bali's cultural heart, into the spotlight with her book Eat, Pray, Love. But before the book and film hit big in 2010, Bali was quietly pulling in backpackers, surfers, and travelers in search of beauty and holistic living on a budget. Maybe it's Bali's scenery, or just the unique vibe, that get under the skin. While the rest of Indonesia is predominantly Muslim or Christian, Bali is a Hindu island. The unique architecture — both ancient and modern — blends present and past. Sometimes telling the difference between a 500-year-old temple and guesthouse/restaurant built last year isn't as easy as expected! Bali is considered one of the most romantic islands in the world and is a top honeymoon destination in Asia. Although the traffic-choked roads aren't much of a turn-on, the lava-meets-sea coastline and rice terraces are indeed exotic eye candy. There are many hidden finds scattered around the island. The volcanic soil provides a fertile landscape of rice terraces, flowers perpetually in bloom, and rainforest canopy. Numerous artists and creative types have relocated to Bali to enjoy the healthy energy and fresh air. David Bowie had his ashes scattered there in 2016. Despite a heavy dose of developments, upscale hotels, and golf courses, Bali still retains much of its original magic discovered decades ago by a small handful of travelers. Perhaps one of the most enticing aspects of Bali is the level of luxury that travelers can enjoy on a budget. Gorgeous boutique hotels can be found for US $50 per night. Spending just a little more yields luxury that would easily cost $200+ per night in other island destinations. Bali may be paradise for some, but it doesn't even come close to defining Indonesia as a whole. There are plenty of other inviting destinations farther afield. Unfortunately, an estimated 80 percent of international visitors to Indonesia see only Bali before returning home. Consider supplementing your trip to Bali with one of Indonesia's other exciting places! Aside from the usual trio of shopping, dining, and relaxing (all three are excellent on the island), Bali offers plenty of interesting activities. Try Surfing: Bali has been luring surfers since the 1930s. The lack of a reef and abundance of surf schools make Kuta Beach one of the most popular places in the world to try your luck as a newbie on a board. For pros, Uluwatu and other areas around the island offer more of a challenge. Visit Ubud: Once Bali's green little hippie escape, Ubud's reputation has spread widely and so has its development — much the same fate that Pai in Thailand is suffering. Even still, the verdant rice fields, boutique shops, spas, and holistic healing centers are enough to lure people away from the beaches and into the hot island interior. Enjoy the Beaches: From the busy scene in Kuta with sunbathing and nightlife, to more upscale and sophisticated resorts in South Bali, there's a beach for everyone. Seminyak and Legian are wide, popular beaches, but there are plenty of other options away from the busy west coast. See the Interior: Lakes, volcanoes, rice terraces — the lush interior of Bali outside of Denpasar is enjoyable. Villages clinging to the slopes of active volcanoes and hot springs are options. Fortunately, Bali is small enough that day trips can be made to explore the rainforest without the need for an overnight stay. Grab a motorbike (Ubud is a central place to start) and go! Diving and Snorkeling: The diving in Bali is often cheaper than that in Thailand and even more rewarding. Scuba shops abound. Mantas and mola-mola (sunfish) regularly call into nearby Nusa Penida. The black sands of Amed on the northern part of the island lure divers who come to see the old USAT Liberty wreck and enjoy good shore diving. Denpasar International Airport (airport code: DPS), officially Ngurah Rai International Airport, is Indonesia's second-busiest airport. Fortunately, the little airport was renovated in 2013 and 2014 making it both beautiful and more able to greet the many arriving passengers. The airport serves as a hub for Garuda, Wings Air, Lion Air, and Indonesia AirAsia — four airlines with flights servicing all of Indonesia and Southeast Asia. Direct flights can be found from Europe, the Middle East, China, Japan, Australia, Russia, and other places. Inconveniently, there are still no direct flights from the United States to Bali. American travelers can get the best deals by first flying into Bangkok or Kuala Lumpur, then taking a budget "hop" down to Bali. But there is good news: Bali's airport is located only one mile from Kuta — the most popular tourist beach on the island. Unless you begin your trip in Ubud, you could be out of the airport and on a beach within an hour or less of landing! The weather in Bali is pleasantly warm throughout the year, but like most places in Southeast Asia, the annual monsoon can put a damper on island fun. Heavy rains in the winter months can chop up beach days. Expect the worst rain between December and March. The "shoulder" months just before and after the rainy season are often good times to enjoy the island and avoid some of the crowds. Bali is driest and busiest during the summer months between June and August. Unfortunately, this is also when large numbers of travelers who want to escape winter in the Southern Hemisphere make a beeline for Bali. If you travel during these times, you're going to have to share the island! If Bali in summer is too busy for your tastes, consider popping over to one of the nearby Gili Islands in Lombok.